but my go to jewelry item of choice is a statement necklace and not much else. I love the necklaces at BaubleBar, big, unique, and affordable! What is your daily jewelry statement? BubbleBar does have a lot of cute necklaces.. I was kinda surprised by how affordable they are! I love this entire outfit. That leopard skirt is super cute!! LOVE this outfit on you, so stinkin cute! The necklace is fabulous and totally perfect. Love this look! BaubleBar has quickly become my favorite jewelry spot for the same reasons. I'm addicted to their statement necklaces and they're just so affordable! love the statement necklace and also that skirt. I love red lipstick but somehow I just cant pull it off! Gorgeous necklace!! I love your leopard print skirt - what a cute look! LOVE this and i love that necklace. you are looking fab, girl. You look so cute, I love the high waist skirt and that necklace is a great statement! Go girl...looking fierce! Is it creepy that I always try to figure out where you live by your pictures? Could this be Belmont Blvd? I caught my bus there this morning!! Love this look, is there anything more classic than leopard print and red lips? I have recently decided that my jewelry collection is lacking, and I could def use another statement necklace (or 2, or 4!) love yours!! haha - I try to figure out where in Nashville people are too! I have lived in some form or fashion around Hillsboro Village during my 3 years in Nashville so far, but I currently live closer to Vanderbilt... certainly would love to live in one of the majestic homes on Belmont Blvd... le sigh! Love the necklace from baublebar! they have so many cute necklaces! and I love this outfit - that skirt is so cute! You look great in red lipstick! I wish I remembered to wear it more often, but sometimes I feel like if I start the day with bare lips (as a I usually do because I'm eating breakfast in the car), then it will seem weird if I suddenly have bright lips after lunch. I really like your black statement necklace and how you paired it with simple items to let it stand out! That necklace is really stunning and you're looking hot with the red lip! Necklaces are just about the only jewelry I wear and I love this one! The skirt is awesome too! Hehe, I loved the "most interesting man in the world reference". This is a great look--I love your Bauble Bar statement necklace. I agree, they have great stuff! I love this light, airy skirt. It's super cute and shows off your great legs! You look fantastic! Love the necklace and lipstick: what a fabulous red. This outfit is so cute! 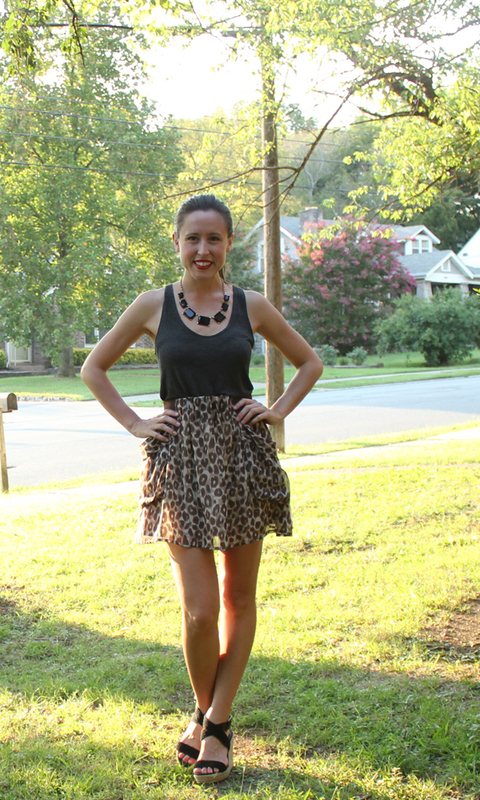 I LOVE the leopard print skirt so much! And I love how you let the statement necklace be your main piece of jewelry. Those Target strapy wedges are sooo cute. I always have a hard time finding cute black wedges and have already blown out two pairs of TOMS black peep toe wedges. Very cute outfit all together! TWO THUMBS UP here!! Thank you dear! I just had to start going for it... I am still a little nervous that I have it all over my face, but lip stains have given me more all-day lipstick confidence! haha - thanks! Glad someone got it! I have to have a black pair of wedges in my closet at all times - and these Target ones are rocking! Now I just wish I had gotten them in gold too! If you see them, scoop them up... you will love them! LOVE LOVE LOVE this look Jessica! You look absolutely gorgeous! Alright, I'm loving this outfit and I think you need to give it to me :) Please and thank you! Sisterhood of the traveling outfit!? Love it!